The death of a loved one can be a traumatic experience and causes emotional pain and suffering. However, in some cultures the loss can result in physical pain as well. Certain cultures believe this physical representation of emotional pain is essential to the grieving process. This can be seen in the Dani tribe in Papua, New Guinea. Some tribe members have cut off the top of their finger upon attending a funeral. This ritual is specific to the woman population of the Dani tribe. A woman will cut off the top of her finger if she loses a family member or child. The practice was done to both gratify and drive away the spirits, while also providing a way to use physical pain as an expression of sorrow and suffering. The Dani tribe members have the religious belief that if the deceased were a powerful person while living, their essence would remain in the village in lingering spiritual turmoil. The practice is performed by first tying a string tightly around the upper half of the finger for about 30 minutes. This allows the finger to become numb for a “near” painless removal. The finger is removed by using an ax and the open sore is cauterized both to prevent bleeding and to form new-calloused fingers. The left over piece of finger is dried and then either burned to ashes or stored in a special place. 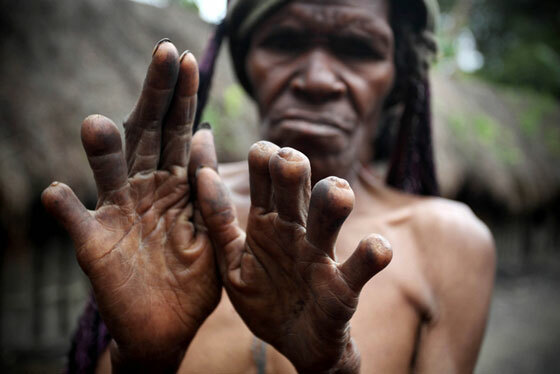 This ritual is now banned in New Guinea, but the practice can still be seen in some of the older women of the community who have mutilated fingertips. The practice of causing physical pain to show grief and deal with mourning can be seen in a numerous amount of other cultures as well. Cutting arms, legs and body, shaving off hair from the head, and burning skin are rituals used by other cultures during the grieving process. Grieving is a natural response to losing someone and everyone has different ways of dealing with grief. After listening to the podcast How Stuff Works in which Dr. Stutz discusses mortuary rituals and their importance, I thought of a specific scene in The Undertaking. The movie includes a heartbreaking story of a young family in which the only child had been diagnosed with a neurological disease that would take his life before he reached three years. The parents sought refuge in the structure of rituals involving death in our society. The young mother explained the calming effect of arranging for funeral services before her son’s death. It seemed as though having the funeral service in place allowed the parents to answer the question, “What now?” after their son’s death. As discussed in the podcast, ritual is powerful as a transformative tool. The ritual of funerals and burial allowed the parents to have a set time in which they could transition into their new life. Although they knew that their son was dying, the process of burial allowed them to cope in steps and at their own speed. Each part of the burial process served an important role in their processing of death. The mother explained that the closing of the casket was extremely symbolic and powerful. It allowed her to accept for the first time the loss of her son’s physical body. To me, this scene illuminates the vital importance of mortuary rituals. Though at times they may seem silly or unnecessary, they allow a slight measure of control in an uncontrollable situation. During class on Tuesday, we watched a short film called The Undertaking. The movie investigates the life and work of Thomas Lynch, the director of a funeral home. The film follows three independent stories of death ranging in age and type and in doing so, comments on the way that Americans perceive death and dying. One aspect of the film that stood out to me was my immediate aversion to the idea of dressing and embalming a corpse. As I watched the funeral home worker paint the face of a deceased elderly woman in preparation for her funeral service, I thought about if I could ever carry out the same task. Each time I thought about placing myself in his shoes, I felt an innate sense of discomfort. I began to think about why I might react so strongly and negatively to the idea of dressing a body for a funeral service. This made me begin to think about the aspects of death that make me most uncomfortable and why that might be. After some reflection, I realized that the dead body itself, in its absolute stillness, is quite unnerving to think about. Maybe this is because, as a society, we are constantly shielded from ever viewing death in its physical state. We rarely ever see dead bodies outside of certain contexts including hospitals and funeral services. Perhaps if we were exposed to death and dead bodies more often, I would not have felt so uneasy watching a man prepare a dead body for a service. I began to wonder how people who work in the funeral service industry become adjusted to constantly seeing dead bodies and discussing death. Do they also have the same immediate negative reaction that most of us do towards seeing a dead body? Death is already an uncomfortable topic to talk about, let alone the idea of human sacrifices. From the pre-Columbian era, human sacrifices were pretty common in Maya culture. The Maya civilization covered a large area of land which included southeastern Mexico and northern Central America. The reasoning behind this ritual was due to the belief that it was offering of nourishment to the gods. The sacrifice of a living creature was a powerful offering and a human sacrifice was the ultimate one. Usually, only high status prisoners of war were sacrificed while other captives were used as the labor force. There were several different ways these sacrifices occurred. The most common ways were decapitation and heart removal. Dedication to a new building or new ruler required a human sacrifice. Many of these were depicted in Maya artwork and sometimes took place after the victim was tortured (beaten, scalped, burned, etc.). If the sacrifice happened through heart removal it took place in the courtyard of the temple or summit of the pyramid-temple. The person was painted blue and wore a headdress while being held down by four attendants representing the cardinal directions. The nacom, or official, used a sacrificial knife to cut into the victims chest and pull out the heart. He then would pass the heart to the priest, known as the chilan, where then the blood would be smeared onto the image of the god. Once this occurred, the body was thrown down the steps and skinned by assistant priests but the hands and feet were left alone. The chilan then wore the skin of the victim and performed a ritual dance of rebirth. These rituals provided hope and security to the Maya culture and demonstrated their own outlooks on death. “Human Sacrifice in Maya Culture.” Wikipedia. Wikimedia Foundation, 07 Feb. 2017. Web. 22 Feb. 2017. “Maya Civilization.” Wikipedia. Wikimedia Foundation, 19 Feb. 2017. Web. 22 Feb. 2017. There are just somethings that we do not like to talk about. Like how often you wear the same pair of socks, or how you take phone calls while sitting on the toilet, or how we all are dying. Talking about death is not the most comfortable point of conversation. It is so much a problem that there are millions of books, arties, and movies on just talking about death. While these might be very helpful, they also seem to leave us wondering about the little things. Like what is dying like? This is where Claire and The Clairity Project come in. 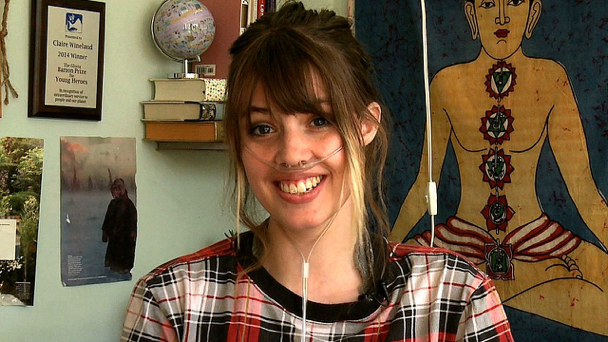 Claire Wineland is an 18-year-old girl with Cystic Fibrosis. Cystic Fibrosis is a genetic disease that causes a thick buildup of mucus in the lungs, pancreas, and other organs. It clogs up airways, traps in bacteria leading to infection, and prevents the body to function correctly. Throughout her entire life Claire has been told that she is going to die. It has become a normalized facet of her everyday life. About 2 years ago she started making YouTube videos to share her personal story of living with a terminal illness and coping with dying. Her witty and lively personality shines through when she talks about that it is like to be dying. The way she talks about the subject of dying goes against the hush-hush nature of most conversations of death. I find Claire and her openness as a refreshing change and someone I can relate to. Growing up my dad was diagnosed with an acute chronic case of pancreatitis. He has been hospitalized more time than I can count and almost died a few times. I and my family have normalized the entire process to the point where we can make jokes. To many people making jokes about death may seem completely wrong. Yet, I see it as a way of being about to openly accept dying. I think the way that Claire can openly talk about her illness and dying is a way of accepting death. She is showing others that it is ok to talk about death and being sick. These topics do not need to be such a taboo. The Western definition of death is known as “the irreversible cessation of all vital functions especially as indicated by permanent stoppage of the heart, respiration, and brain activity”. Although this is true to define the end of someone’s life, there are many who believe that there is more to life even after death. Those who worship Hinduism believe that death does not necessarily mean the end. They follow the idea of reincarnation which means that the soul is indestructible and repeatedly takes on a physical body until moksha. Moksha is a term in Hinduism which refers to the various forms of liberation or release which occurs when the cycle of dying and rebirth ends. It is the central concept in Hindu tradition and included as one of the four main goals in human life. These goals include dharma (virtuous, proper, moral life), artha (material prosperity, income security, and means of life), and kama (pleasure, emotional fulfillment). The four together are called Purusartha. Since reincarnation is essentially another chance of life, there are some important things to keep in mind. Good intentions and actions lead to a good future while bad intentions and actions create the opposite outcome. This plays an important role in how one is reincarnated. 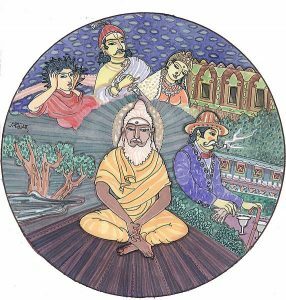 There is no heaven or hell in Hinduism but more of a release from the cycles which brings freedom to the individual. The death of a family member is seen more as a celebration rather than a time of mourning. Hindus are cremated due to the fact that burning the body releases the spirit from the person. “Reincarnation.” Wikipedia. Wikimedia Foundation, 04 Feb. 2017. Web. 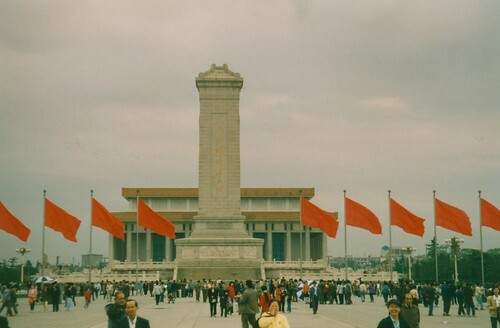 17 Feb. 2017. “A Memory Tree.co.nz – a lifetime of memories.” Customs and Protocols on Death, Dying and Funerals. N.p., n.d. Web. 17 Feb. 2017. “Moksha.” Wikipedia. Wikimedia Foundation, 30 Jan. 2017. Web. 17 Feb. 2017. 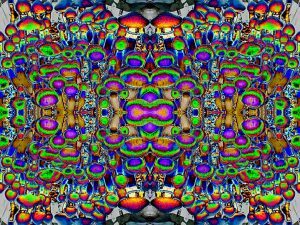 Researchers at NYU and Johns Hopkins Universities have found that a single dose of the psychedelic compound in magic mushrooms, psilocybin, can diminish depression and anxiety related to dying in advanced cancer patients. Roland Griffiths (researcher as Hopkins) believes that psychedelic drugs are powerful tools for treating conditions including drug/alcohol abuse, depression and PTSD; they are not just for exploring the human mind. Volunteers came to doctors with a fear of dying and stress about their illness. People were interviewed and counseled for over 8 hours before they were chosen for the experiment. Griffiths and Stephen Ross (NYU researcher) administered laboratory-synthesized psilocybin to 80 patients with life-threatening cancer. More than 75% of participants reported significant relief from depression and anxiety. Administration of drug was carefully monitored and supported with counseling services. Overall, the experiment had a healing effect for all those involved. The dose of psilocybin doesn’t result in every participant believing in life after death. However, it was effective in creating a deeper meaning and understanding of the situation. The psilocybin was able to show patients that there is nothing to be fearful of and that everything is going to be okay. Participants were able reassure loved ones that it is okay and they don’t need to worry about what was to come because everything was going to work out. The psilocybin was helpful in relieving the agony of the inevitability of death. 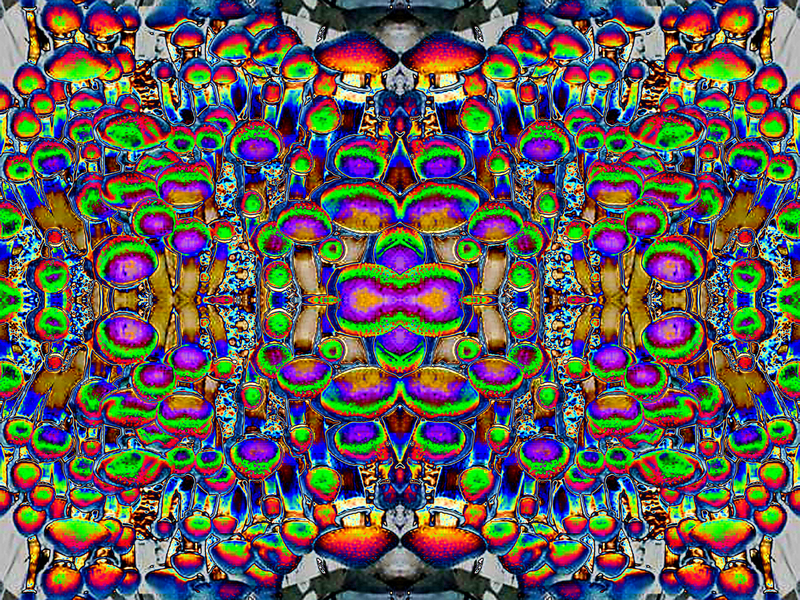 Many reported that their experience using psilocybin was one of the most important experiences of their life. Griffith and Ross found that larger doses of psilocybin were more effective and ‘mystical-type experiences’ showed greater changes in levels of depression and anxiety. 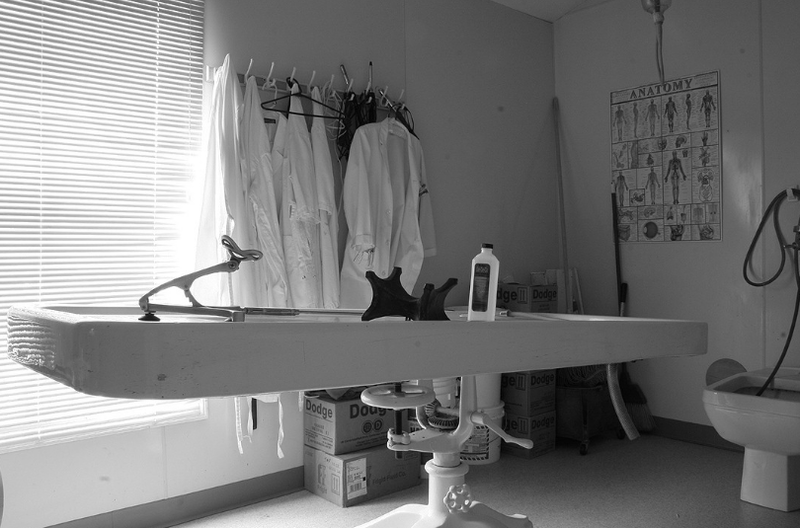 There are always concerns and risks that come with experiments. In the case of psilocybin, about 1/3 of patients reported a sense of fear or discomfort. Doctors were there to comfort patients and remind them of where they were and that they were under the influence of psilocybin. However, is almost all cases, the experience was cathartic and resulted in personal understanding. Sky burials (or celestial burials, as they are also called) are the burial rites of choice for the Tibetans. After a member of the community has died, the body is cut into pieces by a Burial Master, and then taken to a selected site, usually in an area of high elevation. This is because the corpse is then supposed to be eaten by vultures, who tend to congregate at higher altitudes. After the vultures have consumed the body, the belief is that they take the body away to heavens where the soul of the deceased person remains until they are ready for their next reincarnation. This practice is believed to have been practiced for as many as 11,000 years, but there is little written evidence, or physical evidence, due to the fact that the remains are ingested by the vultures or other animals. Sohma, Marina. “Sky Burial: Tibet’s Ancient Tradition for Honoring the Dead.” Ancient Origins. N.p., 15 Nov. 2016. Web. 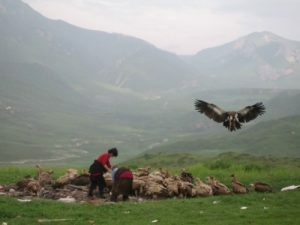 http://www.ancient-origins.net/history-ancient-traditions/sky-burial-tibet-s-ancient-tradition-honoring-dead-007016. Dia de los Muertos, or Day of the Dead, is a tradition and holiday that originates in Mexico, but is celebrated across Latin America. On November 1st, individuals come together and partake in festivals and parades in order to both honor and celebrate loved ones that have passed. 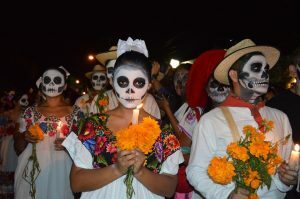 As seen in the picture above, prominent symbols of this holiday are skulls and skeletal depictions, complemented by festive and lively dress, flowers, and light. Family and friends prepare the favorite foods of the deceased, which serves as an invitation for the dead to awake and join in the celebration of their lives. I have always found Dia de los Muertos to be a very respectable and insightful tradition, one that represents the perception of death more as an inevitable occurrence that should acknowledge the lives of the deceased in a positive, communal way. Its believed that the dead would be insulted by grief and mourning, and as such, the dead should rather be honored with a lively celebration that commemorates those that have passed. When comparing Dia de los Muertos to Halloween, obviously very different in their origin and practice presently, death is represented in ways that starkly contrast the other. Halloween seems to follow the idea that death is scary and gruesome (imagine how skeletons and the dead are made to look), whereas during Dia de los Muertos, the dead are depicted more beautifully, often with colorful skulls and clothing. In my opinion, the latter depiction helps, especially with children, to better normalize the occurrence of death in a way that is not feared or avoided. In fact, during this holiday, death is seemingly transformed into a human experience that is natural and beautiful; a time where the dead can be remembered in a lively and festive manner, in which their lives are honored through food and activities that bring everyone together. The holiday actually occurs over two days, on November 1st and 2nd, in which children and the elderly have respective days that they honored through different symbols and activities. Ultimately the holiday as a whole commemorates those that have passed, but continue to be loved and celebrated. “Dia de los Muertos.” National Geographic Society. National Geographic , 09 Nov. 2012. Web.